So every great product has some sort of feature, once you discover it, there's no turning back. I though I'd seen virtually every type of candle made. 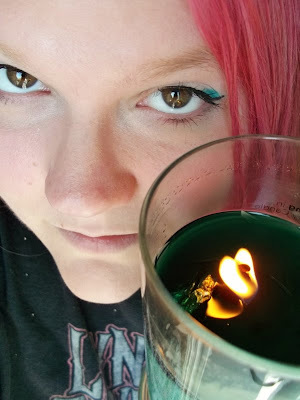 There are different colors, different waxes, tarts, votives, pillars, lanterns, electric, scented, color changing, wood wick, slow burning, floating, and more candles. So why on Earth did it take so many commercial years for someone to come up with the concept to put 2 of Woman's favorite gifts together? That's right ladies, DIAMONDS and CANDLES, and soy candles in Glass Pillars at that! If you have never heard of this newly begun company it's much to late to close the browser. Consider this the beginning of a very passionate addiction with some of the most sought after candles in the nation. Run by 3 co-owners (2 of which is a married couple) this ingenious business plan centers on the concept of providing uniformly high quality 21 oz Glass Pillar Soy Based Candles with a hidden ring worth $10, $100, $1000, or more- in every jar! It is a concept that has subsequently been duplicated with less quality by countless brands since. Before you raise a skeptical eyebrow and call me crazy (I assure you I had a similar reaction at first), just ask 1 of the 263,000+ Facebook fans the brand has amassed since it's birth in January of 2011! 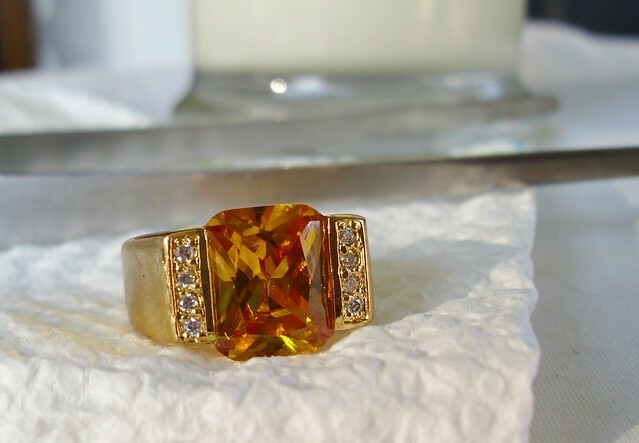 And if you think 'real' diamonds are a long shot, you might want to browse the hundreds of customer submitted images with stunning REAL rings ranging from precious metals and CZ to REAL Diamonds. Of course some of the rings are worth just $10, but a quality Natural Soy Candle of this size will easily run you the asking price of $24.95+, so you truly have nothing to lose. And no matter, real or not, it's sure to be a wonderful treat unwrapping your very own ring. It's like Cracker Jacks for adults! I only wish they would put the ring just a little further down; it's hard to keep burning these candles when there's another already in line, with a fresh ring! Momma Told Me was one of, if not, the first blogs to break the news about the Diamond Candles craze. I'd spotted them on an 'unusual new products roundup,' and they were happy to send along a 21oz White Chocolate Diamond Candle for review here on Momma Told Me. That was the candle that started it all. Subsequently since I have converted countless family members and friends into regular customers, and addicts. Right off the bat I was impressed with the sheer size and presentation of these beautiful Glass Pillar Soy Candles. Each pillar had it's own cap for re-sealing and extended use, with the designated 'diamond' spot peering from a gemstone like clearing in the wax 3 inches down. I was originally glad to see the ring wasn't all the way at the bottom because candles this size can have over 50 hours of burn time and I am NOT patient. Luckily, the soy wax is smooth burning, and the sweet aroma reminded me of freshly baked blondies (or cupcakes). ----It's important to trim the wick as instructed, for an even burn, never burning for more than 4 hours at a time. I'm always awful about this part of candle maintenance, and it can come in hand when trying to burn down to the ring. 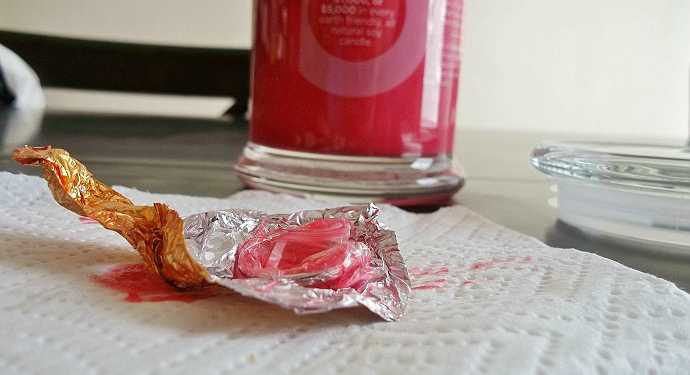 Once the wax has cooled, and the foil wrapper is revealed you may pry the ring away from the jar's wall and unwrap it. I happen to have a dedicated pair of extra long tweezers just for Diamond Candle ring retrieving, but a fork or spoon will work just as well. The physical foil cocoon is affixed to the wall of the pillar with a dollop of sticky glue. This cleans out of the glass, once the candle is fully burned, so the owner may reuse the pillar. Inside the very slippery (wax covered) foil is a small baggie with a lovely ring inside. Sizes vary, and my only suggestion is to possibly offer a choice of ring sizing for a few dollars more (if desired). 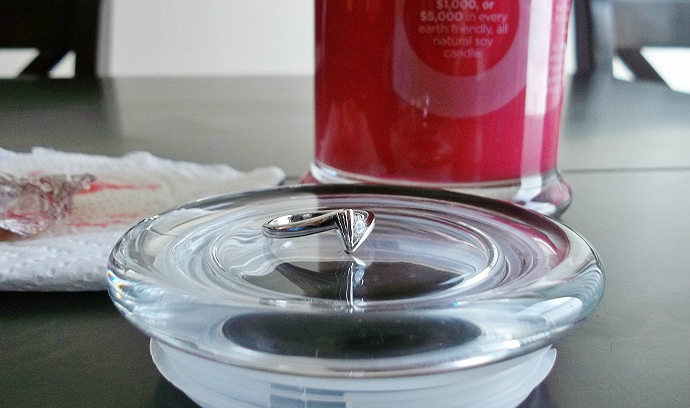 Once again, it's the novelty of enjoying a high quality candle and the bonus of having a possibly genuine ring inside that you pay for- not a jewelers experience. 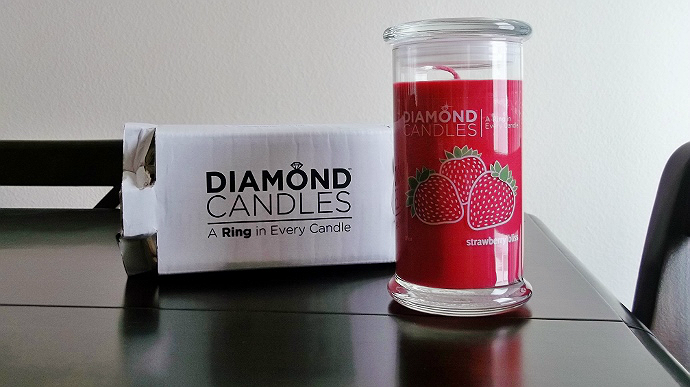 If you desire to sell or swap your rings there is a (non affiliated) group on Facebook where Diamond Candles fans interact. In either case I must say my first ring was absolutely stunning (though a tad too small for me, perfect to pass on or collect). It glistened beautifully in the sunlight, and was marked inside with a location and identified as gold plated. I've seen many gorgeous rings on the Facebook wall, of all shapes, colors, and sizes, and have already ordered over 15 candles since. (That's pretty high praise from me). My most recent purchase from their Summer inspired collection being; Tropical Retreat, Midnight Kiss, Pomegranate Lemonade, Strawberry and Hawaiian Coconut. Tropical Retreat is a lovely shade of teal with a blend of banana, orange, coconut, and grapefruit. I let the other half pick this scent out (my compromise, as I got the candle AND the ring out of the deal). I have to say, this is one of the most natural fragrances yet! 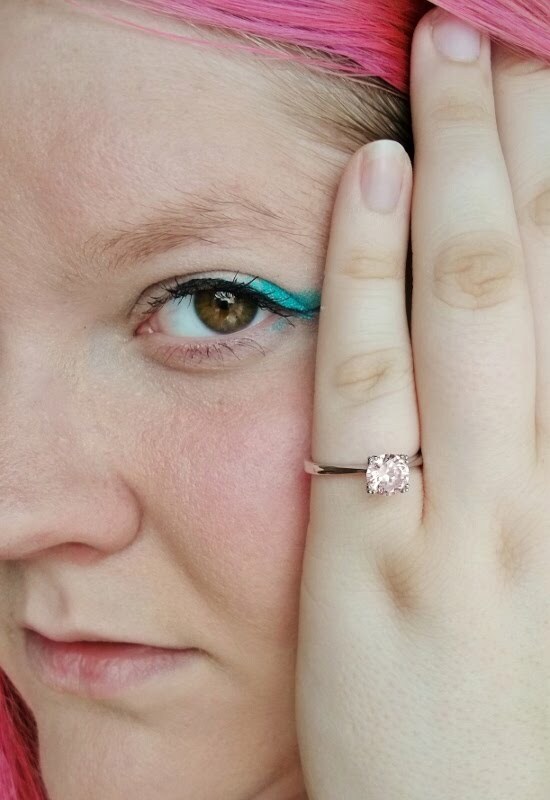 It burned beautifully, and I was thrilled to uncover my SZ9, marked, ring with Pink hued gemstone. While this particular ring is not a $5000 find, I've had many rings over $100 in value, and am happy to report this beauty isn't tarnishing through wear. If you're a fan of candles, and crave the Diamond Candles experience, but are sensitive to fragrances the company thoughtfully offers an Unscented, white, variety. Soy candles are incredibly smooth burning, and easy on allergies, though the fragrances can be very strong and long lingering. Diamond Candles has experienced immense success since their launch in 2011, and promise new fragrance blends, and seasonal collections every quarter. You may be lucky enough to score a daily deal on various (Groupon like) sites, here and there, but these are well worth their asking price at $25. Be sure to order your favorite fragrances when you see them, because they sell out fast! What Daughter Says: Diamond Candles receives two enthusiastic thumbs up from me- I've become addicted! 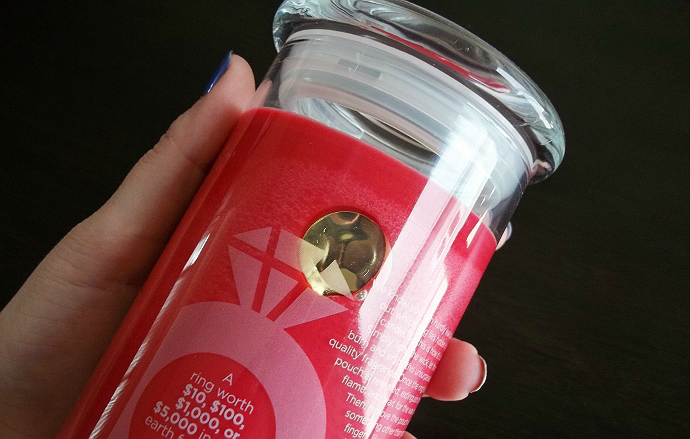 One lucky Momma Told Me follower will win a Diamond Candle! **Please Note: This giveaway is not sponsored by, or in any way associated with Diamond Candles. Product for the initial review was provided gratis, in exchange for the initial post. Supplemental reviews have been based on products purchased subsequently. 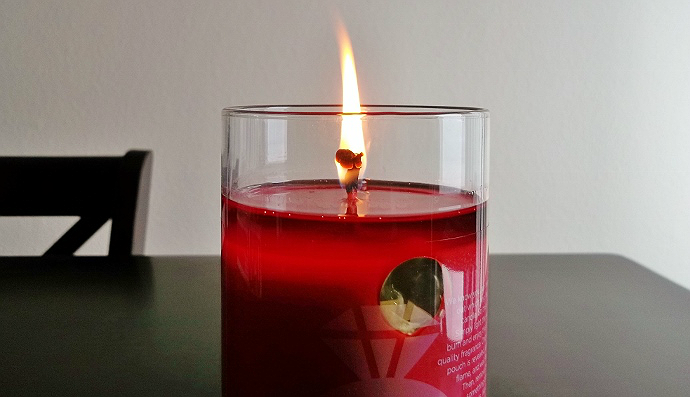 Giveaway is sponsored by blog owner, hoping to spread the love for Diamond Candles. I'd like to try the Honeysuckle! Their Black Raspberry Vanilla Candle sounds great! I'd like to try the cinnamon pinecone! I would like to try Honeysuckle!! i would love to try the orchid meadow! I would like to try the Sunwashed. The summertime candle sounds like a good one to me. Peachy Mango Candle sounds great! I'd love to try Honeysuckle!! I think I would like the sun washed. I would love to try the Cozy Cabin Candle. I would like to try rosewood. Black Raspberry Vanilla sounds yummy!!! I would like to try the orange vanilla candle. I've wanted to try Diamond Candles for a while now. If I won, I'd go for the Vanilla Lime. Peachy Mango sounds great to me. I would love the Honeysuckle Candle. Thank you for the awesome giveaway! i have always wanted to try out there candles! I would like to try the Hawaiian Coconut. Vanilla. I love anything that smells like food! Black Raspberry Vanilla or the new Vanilla Lime. i love candles that smell like something yummy is baking in the oven and the 'pecan pie' scent sounds awesome! I'd like to try Fresh Cut Grass. I'd go with the Cupcake or Vanilla Cream! I'd like to try the cupcake candle! I would love to try the honeysuckle. I'd choose the Peachy Mango! I would love to try the Brown Sugar Pudding! The Hawaiian Coconut candle would be my first choice. I'd most like to try Peachy Mango. Thanks. I would LOVE to try the Vanilla Lime candle (when it is not sold out)! I love Diamond Candles, I own at least a dozen myself. I would love to try the Vanilla Lime! I would LOVE to try the Carnival Candy candle! They are seem great!! The Cupcake Candle sounds yummy! I love brown sugar pudding. Mmm! I'd love to try the honeysuckle! It's one of my favorite scents.